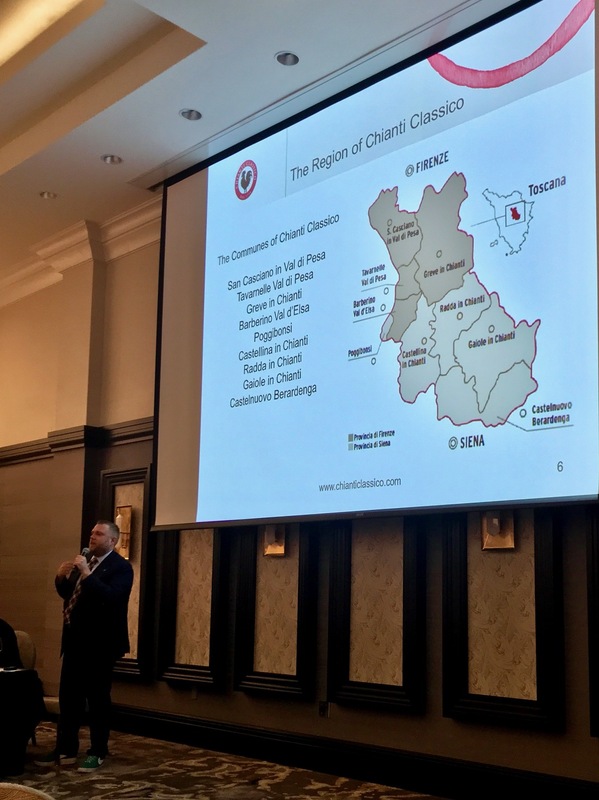 Houston wine professionals enjoyed the Chianti Classico Experience on Monday, July 16, at The Post Oak Hotel in Uptown. 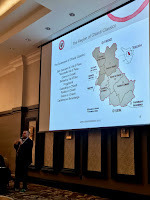 This master class and tasting was designed to explore the diversity of the terroir of seven Chianti Classico communes. Jeff Porter, the American ambassador for the region, was the guide for this endeavor. This unique region has a broad mix of soils along with varying vineyard altitudes and climate differences across the communes. These small distinctions make themselves known in the glass. The territory lies between the provinces of Siena and Florence in the heart of Tuscany. The region considers 1716 to be their date of birth which is when the borders of production were first established though Chianti wine appears in trade documents as early as the 13th century. The modern governing body was established in 1984 when Chianti Classico achieved its current DOCG status, the highest recognition for premium Italian wine. A minimum of 80% of this red wine must be Sangiovese while it can have up to 100% as well. The other 20% that may make up this red wine blend are indigenous grapes like Canaiolo Nero, Colorino, Ciliegiolo, Malvasia Nera, as well as international varieties like Cabernet Sauvignon, Merlot, and Syrah. 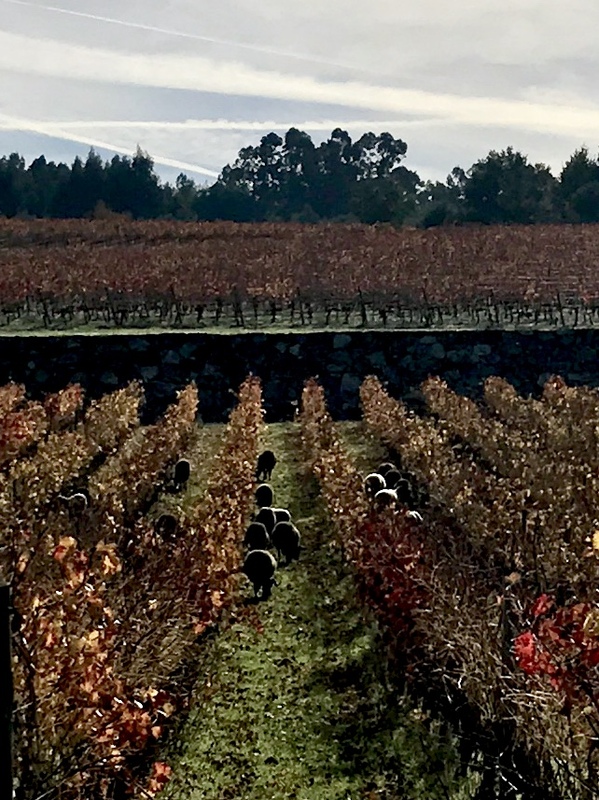 There are three main soils in the region: Galestro, a clay schist soil with layered limestone and sandstone that can be easily broken by hand, Albarese, a more compact marl and limestone soil and Macigno/Arenaria, hard sandstone rock. 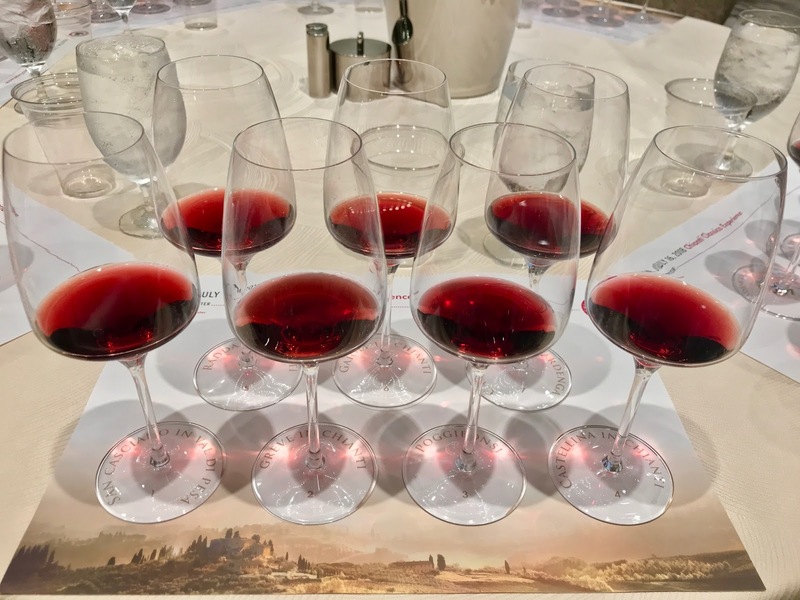 The tasting was of seven Chianti Classico wines from the 2015 vintage, each from a different district. 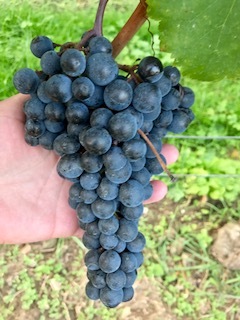 The 2015 vintage was a fantastic year across Tuscany. Yields were down but quality was high. The weather was ideal with early spring rain which replenished the groundwater followed by warm summer days and cool nights. 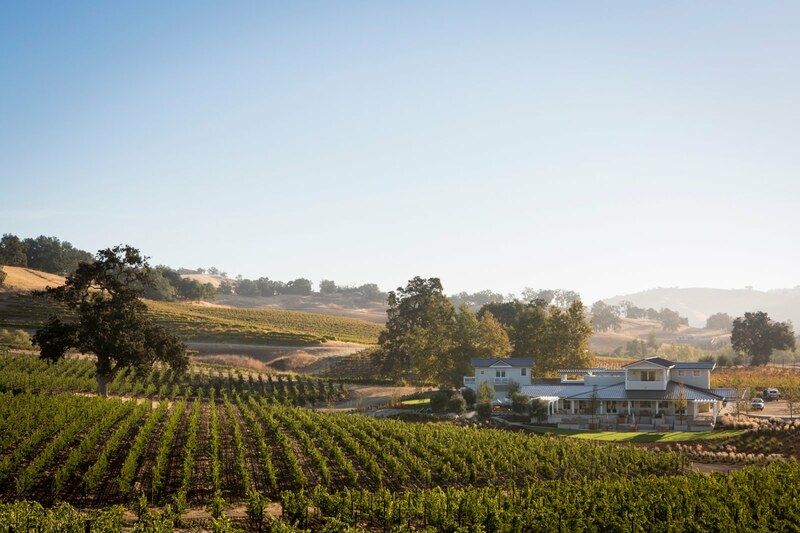 August rains refreshed the vineyards in late summer to allow for full ripening before harvest. Chianti Classico is one of the most historic wine regions in Italy, Porter stated that it was also "a fast growing and dynamic region." Over the past ten years, the Chianti Classico DOCG has produced 35-38 million bottles annually and exported to 130 countries last year. There are both richer, more concentrated versions and fresher, lighter, more elegant styles and everything in between. Chianti Classico wines should always be fresh, balanced, and fruity, they should also be easy drinking and food friendly. The diversity of the region's terroir means that there is a Chianti Classico wine for everyone. The visiting winemakers shared how pleased they were with how well the wines paired with Houston's barbecue during their time here. All of these wines are priced under $20 and are highly recommended, they offer great value for the price. Notes of tart red cherry, dried leaves and a touch of leather with a supple smoothness and a nice persistence. Fresh and elegant with red cherry, dried herbs and sweet ripe tannins, very well balanced, silky and drinkable with a lingering mineral-laced finish. Cinciano Chianti Classico 2015 - Another organic wine, this one from the Poggibonsi district located in the west central portion of the region, the vineyards sit at 250-350 meters above sea on rolling hills of medium textured albarese based soils with some galestro. Sales manager Valerio Marconi presented the wine which was fermented in glass-lined concrete tanks with selected yeast then matured in Slavonian oak for 8-10 months with at least three moths aging in bottle. Fresh and fruity with red cherry, plum and a light floral note, powerfully structured yet lighter weight. Bandini Villa Pomona Chianti Classico 2015 - Established by her great grandfather in 1890, owner Monica Raspi, a vet by trade, became a winemaker ten years ago when her mother was ready to retire. Raspi couldn't bear the thought of parting with the family business. Located in Castellina in Chianti, a larger district in the southwestern part of the region with vineyard altitudes of 350 meters above sea level on medium textured calcareous marl with gravel, clay, silt and sand which allow for deeply rooted vines. 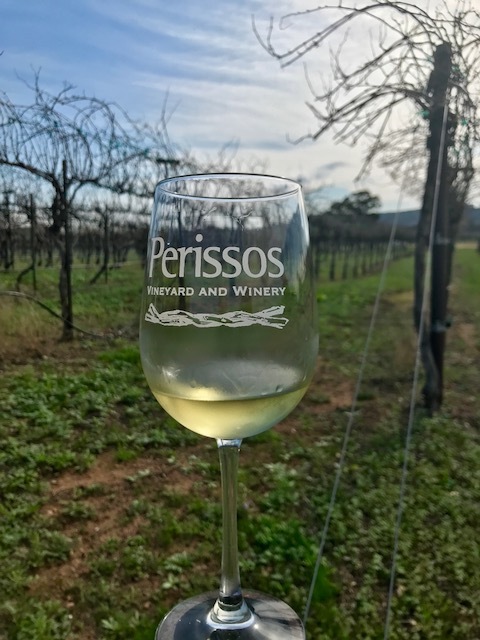 This organic wine is vinified for 18-24 days in steel tanks with natural yeasts on the skins followed by malolactic fermentation. It is then matured for 8 months in Slavonian oak and bottle aged for 3 months. Elegant and pure, with higher acidity and a lighter body with red cherry, thyme and a fresh, lingering mineral finish. 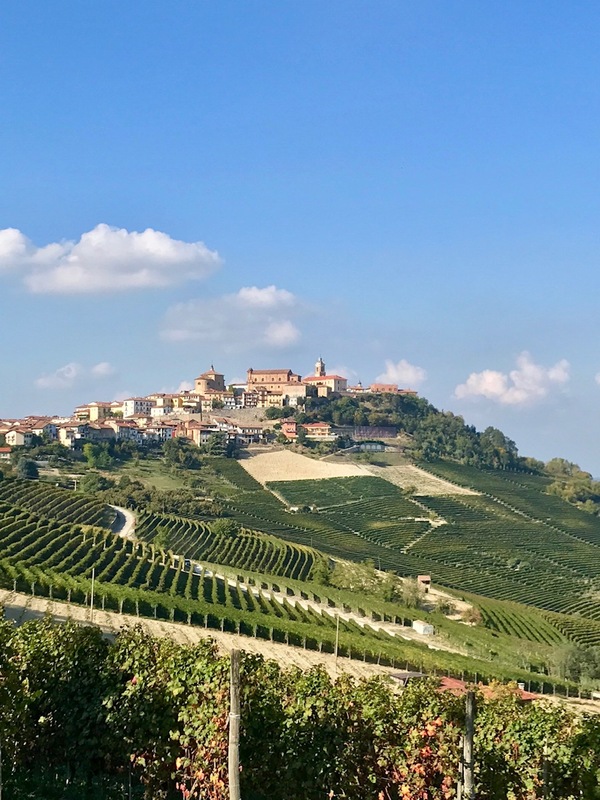 Castello di Albola Chianti Classico 2015 - Managing director Alessandro Gallo presented this 100% Sangiovese wine from the Radda in Chianti district, a beautiful hilltop town and the smallest commune in the region. With vineyards located at altitudes of 400-500 meters on clay-based soils that drain well due to the presence of fine gravel from both Galestro and Albarese. The grapes are vinified in stainless steel with selected yeasts. After malolactic fermentation, the wine is aged in Slavonian oak barrels for 12 months followed by 3 months of bottle aging. Cranberry, cherry and lavender with good acidity which Jeff Porter describes as "nervous and crunchy", fresh and delicate with a mineral finish. Badia a Coltibuono Chianti Classico 2015 - From the Gaiole in Chianti district on the eastern side of the region with vines planted on clay and limestone rock at altitudes of 260-370 meters and tended to by a Zen meditation master according to Porter. This organically grown wine is a blend of 90% Sangiovese, 10% Colorino, Canaiolo, and Ciliegiolo fermented with indigenous yeasts, macerated on the skins for 3 weeks followed by 12 months of aging in French and Austrian oak casks of varying sizes before 3 months of bottle aging. Fruity with red cherry and strawberry with a light mint note, fresh, fuller bodied and nicely textured. 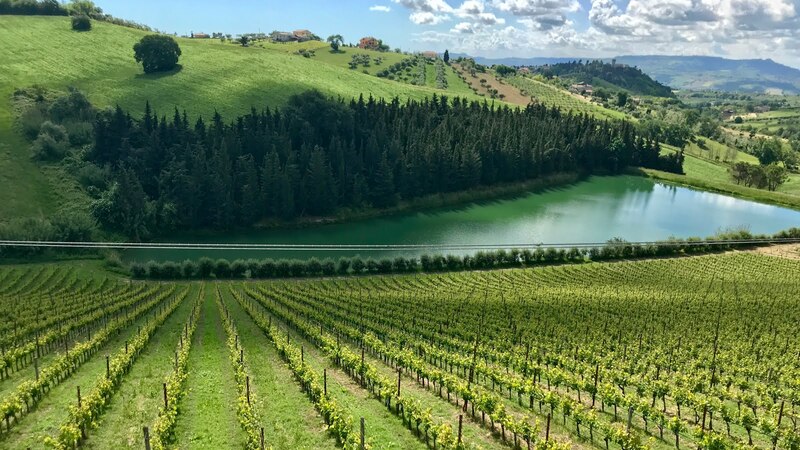 Fattoria di Petroio Chianti Classico DOCG Luiano 2015 - Located on the western side of the southern part of the region, the Castelnuovo Berardenga district near Siena has a warmer, mediterranean climate. The vineyard sits at 380 meters. The wine is a blend of 90% Sangiovese with 10% Malvasia Nero and Colorino which was fermented in cement tanks with half selected and half indigenous yeasts. It was matured in tonneaux for 16 months and bottle aged for 4 months. Aromatic, rich, and flavorful with cranberry, tart red cherry, dried herbs, and sandalwood with a fuller body and a bit of baking spice in the persistent finish. There was a walk around tasting of some Riserva wines during lunch. No tasting notes were taken on these wines pictured on right. All were beautifully balanced and a bit more complex, and all are also highly recommended.